This May, from the 22nd to the 28th, I was extremely fortunate to have attended, all thanks to Professor Downs, the IUCN crocodile specialist group (CSG) 24th working meeting at Kruger National Park. For me to attend such an event the term “kid in a candy-shop” comes to mind. There are in total 23 species of crocodile worldwide (the west and central-southern populations of Nile crocodile are sometimes separated for management purposes) including the two species of alligator and two species of gharial, with a tropical to sub-tropical global distribution. The original idea was to give a brief summary of the research presented, but considering the conference total was 70 presentations and 36 posters, covering every aspect of crocodile biology/conservation including genetics, behaviour and reproductive biology in nearly every species was just too much for a single piece. What I can do is give a brief history of the fascinating group that is the CSG. The CSG had its 2nd official working meeting back in 1973. It was eleven crocodile experts that met in Ndumo Game Reserve to discuss the problems present and future that crocodiles faced. I was surprised and delighted to hear throughout the conference that the CSG can date some of its earliest work/beginnings back to Ndumo, the same area for my own studies. The CSG all agreed on the vital role crocodiles play as apex predators and keystone species in the ecosystems they are present in, and how disastrous the effects would be on said ecosystems with their demise. What they also recognised was the extremely high value placed on crocodile commercially, mainly for their skins but also their meat, and how many people relied on crocodiles to earn their livelihood. Most people would think that the high value crocodiles have both ecologically and economically is completely incompatible and would eventually end in disaster, but I soon found that members of the CSG aren’t most people. Whilst reading the CSG website I found astounding fact after astounding fact about the group’s work and achievements. The one that stands out most for me though I have here: “When the CSG was founded all 23 species of crocodilians were endangered or threatened. By 1996, after 25 years of considerable effort, one-third of the species (8) were sufficiently abundant to support well-regulated annual harvests, one-third of the species (8) were no longer in danger of extinction but were not harvested, and one-third of the species (7) remain endangered. No other group of vertebrate animals has undergone such a dramatic improvement in conservation status.” This is an incredible record of achievement and I hope some of what the CSG do can be replicated for other species in the future. The University of KwaZulu-Natal (UKZN) was very well represented at the workshop by Professor Downs, Dr Combrink and Dr Warner, all of whom focused their presentations on the Nile crocodile here in KwaZulu-Natal (KZN). Professor Downs began with the current status of the Nile crocodile in KZN. From the findings and work done by her and fellow UKZN colleagues, management recommendations for the wild populations of KZN were also presented. Professor Downs strongly emphasised the fact that in conserving this species “one shoe does not fit all” and illustrated how different ecological and human pressures at different sites effected the individual animals and populations differently and that regular and detailed monitoring is key to protecting their numbers in the province. Next Dr Combrink went further into detail on the crocodiles’ historical status in the province. 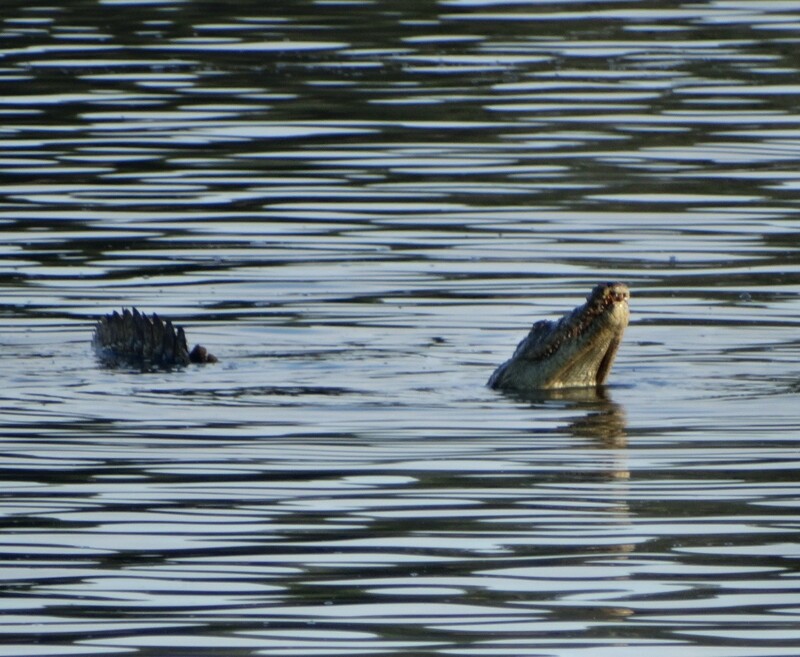 The species was listed as vermin up until 1968 until the pioneering work of the late Tony Pooley, who was represented at the conference by his son Simon who continues to this day in his father’s footsteps, working more on dealing with the issues of living alongside wild crocodile populations. Dr Combrink explained how the vital work Tony did saved the crocodile in the province virtually from extinction and thus the work can still be seen and felt to this day. The wild population in the 1970’s was down to 350 individuals but rose to 1000 individuals by the mid-1990s. 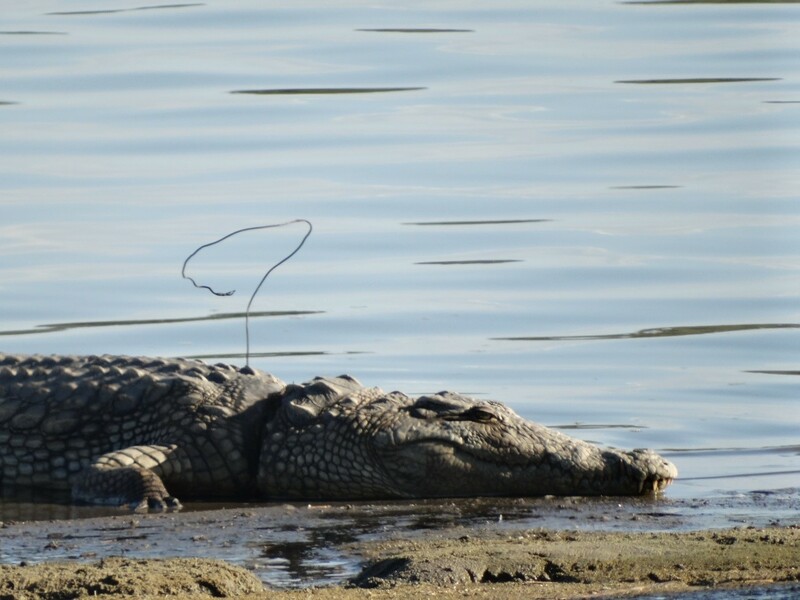 Looking into the future, Dr Combrink explained that major problems are continued degradation of crocodile habitat, invasive riparian vegetation, destruction of nest sites, continued poaching and by-catch in fishing gear. Dr Combrink did emphasis the excellent work done to date, and that there is light at the end of the tunnel though with new management approaches and the success of “market based” conservation showing neighbouring communities the major benefits in conserving healthy crocodile populations. Although the CSG continues to excel in crocodile conservation major obstacles are always ahead for all 23 species. Above a Nile crocodile with a poachers snare deep in the animals neck, the animal was later humanely put down at Ndumo Game Reserve. (Photo by Cormac Price). Dr Warner’s presentation on his research focused on the specific threat of blood lead concentrations in wild Nile crocodile populations in KZN. Dr Warner’s findings demonstrated a drastic difference in blood lead concentrations between females (8.5 micrograms/dL, SD=7.47) to males (98.10 mircograms/dL SD=217.42). Discussing this with Dr Warner, a possible explanation could be due to behaviour. With males being far less shy of boats and human areas where lead fishing gear is present. St Lucia animals had the highest blood lead concentrations and this has been attributed to the busy sport fishing industry at St Lucia. The animals seemed to have a high threshold to lead exposure but the exact health consequences on individuals or overall populations is yet to be seen. Finally, for me it was also a highlight to meet a personal motivator of mine, Romulus Whitaker and his son Nik Whitaker. The Whitakers have done more for Indian herpetology than anybody else and their successes with the gharial, the mugger crocodile, the king cobra and working with India’s huge human-venomous snake conflict is incredible. 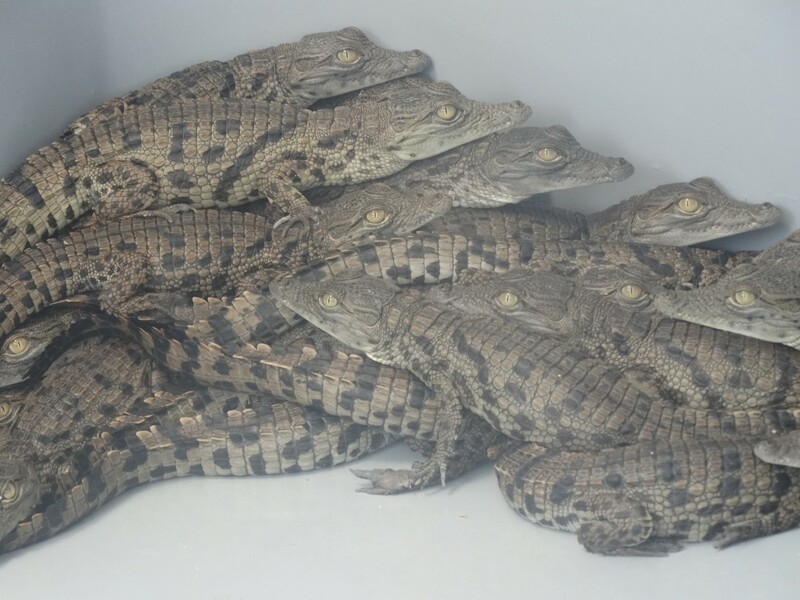 The Madras crocodile bank continues to thrive and I wish it every success and hope to continue following its success. It was also a pleasure to meet Professor Grahame Webb the chairman of the CSG who informed me on the ideas and concepts of sustainable use. I was delighted to hear about Dr Simon Pooleys father’s work up in Ndumo where I will conduct my fieldwork. It was fascinating to hear about how Ndumo was then and discuss how it is now, as well as to listen to Dr Pooleys current work and research in croc-human conflict. Unfortunately, there were many more people I’d like to mention and many more projects I would like to talk about but as I said above its just too much for one piece to do it justice. I would strongly suggest anyone who is still interested to visit the CSG website for further information. The CSG, as I said, is a collection of people passionate about crocodiles for many reasons and “aren’t most people”. The openness and friendliness was incredible and made the whole conference feel more like a family reunion. I was truly immersed in the world of the crocodile and would just like to thank everyone I met and spoke with and congratulate everyone who presented. It was a fantastic week and was delighted to attend. “Sustainable use” one of the key reasons the crocodile became endangered in the first place, its skin is now aiding its conservation. This is done via farming facilities so wild populations are protected and some revenue can go back into wild population research and conservation. The CSG also sets the husbandry standards so that farmed animals suffer as little as possible (Photo by Cormac Price).